We like property as an investment as one is able to raise cash against it at any given point of time. 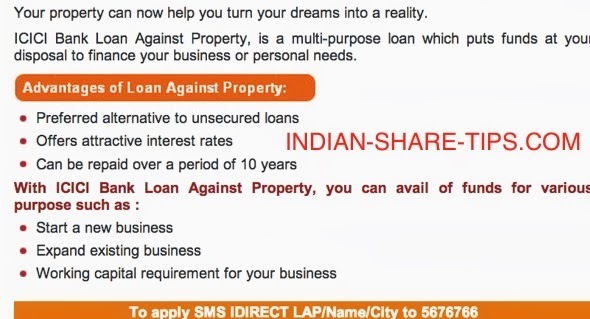 Have a look at below screenshot of an email received from ICICI bank where they are asking you to raise loan against property. Banks are more than willing to provide you loan against the property as every one knows that generally registered value of the property is lower than the actual value and on top of that to safeguard banks interest, they only allow maximum 85% of the total value. If property is not forte then check out intraday trading as stock market trading is our forte to help you make money in stock market and our hot stock of the day gets you profit in less than 2 hours every day.